Benefortin 2.5mg Tablets are used to treat dogs with congestive heart failure and cats with chronic renal insufficiency. 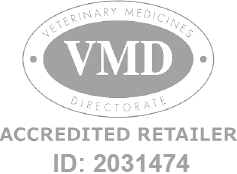 Benefortin Tablets - 2.5mg is a Prescription Only Veterinary Medicine and by law requires a prescription from your vet. Benefortin 2.5mg Tablets are used to treat dogs with congestive heart failure and cats with chronic renal insufficiency. The flavoured tablets are rapidly absorbed into the blood stream to significantly extend the life span of cats and dogs. When given as directed by your vet, the active ingredient lowers the blood pressure in dogs by preventing blood vessels from constricting. This lowers the strain on the heart and protects it from further damage. Also controls levels of sodium and water in the body preventing further damage to the kidneys of cats. This often leads to an increase in appetite and quality of life for cats with renal inefficiency, particularly those in the advances stages of the disease. Benefortin Tablets are manufactured by Boehringer Ingelheim Limited and developed specifically for dogs and cats. As such, they must never be used in other animals.